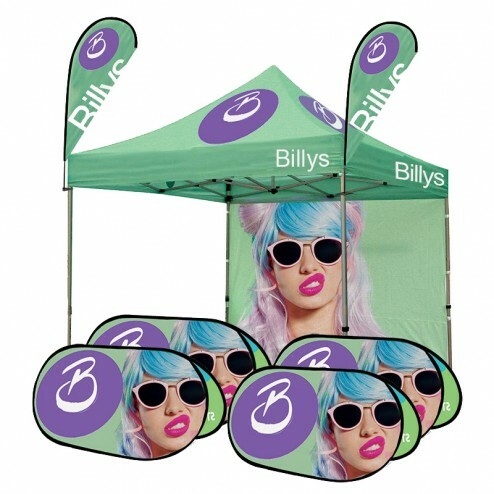 Pitch up with purpose this summer with our custom tent canopy, flags and banner frame bundle. 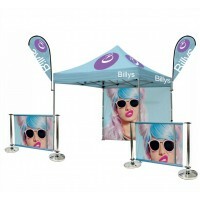 This selection of display equipment provides three different elements to promote your stand. The bundle includes; 2x custom printed mini teardrop flags, 4x custom printed pop up banner frames and a 3x3m canopy to provide the centrepiece for your branding. 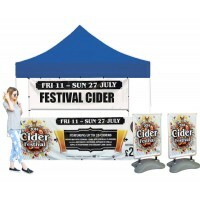 Made from lightweight aluminium, the canopy is sturdy enough to withstand the elements and is perfect for your outdoor events, whether it’s a sports event or a summer fair. 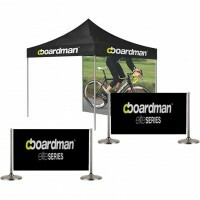 The teardrop flag and pop up banner frames work as an eye-catching addition to the main stand, with all elements of this bundle being lightweight, easy to assemble and with all necessary weights and attachment clamps included. Printed with our vibrant graphics, which are all produced in-house using state of the art printing equipment to ensure the best results for your product are guaranteed, we can customise this bundle to suit whatever occasion you need it for. With a padded carry bag included, you can stand out from the crowd whenever, and wherever you need to during the busy event calendar, so don’t miss out on this great value bundle!